No mom wants to suffer from postpartum depression. Most moms experience it in some degree. Few moms will openly admit to. We don’t want people to think we don’t love our babies or that we’re not grateful for them. We tell ourselves that moms everywhere are successfully having and raising babies, and that we should be able to as well. We tell ourselves it’s just a phase and that it will pass, but we do few things to aide it’s passing. I don’t know if this is standard practice or just something with the hospital I delivered at, but when I went in for my 6 week postpartum checkup I had to take an evaluation for my risk of postpartum depression. It wasn’t an official psych evaluation, but it would serve as a red flag if something could be wrong. A score over 10 meant that I was at risk for postpartum depression. I scored a 22. For 6 weeks, I suffered but thought it was normal. The exhaustion, the fight to keep going, the crying; I thought this was just part of being a new mom. Then I took the evaluation and had an open conversation with my doctor. Yes, it was normal in the sense that most moms experience they same highs and lows after giving birth. But no, it was not healthy and should not be ignored. After leaving her office, I had to have more candid conversations with my husband, our parents, and my boss. Until I could take the depression evaluation and score a 10 or below, my doctor would not clear me to return to work. I would need to enlist the help of friends, family, and yes medication to get to that point. It was a struggle to get better. I had to learn boundaries; what I could handle on my own and when I needed to ask for help. I had to learn to ask for help. We would have my mother-in-law over just so I could go for a 30 minute run and take a shower. It took another 6 weeks and multiple appointments with my doctor before I finally “passed” my evaluation. Even then, my doctor said she wanted to keep me on the current dosage of Zoloft for a year. She said we needed to be realistic; there would be more challenges over the course of the first year and we needed to keep me functioning. It hurts to think about that experience. To remember the mornings that I would wake to Milo’s cries and would be frozen in bed, I didn’t think I had the strength to get myself up and face another day. To remember the days Nick would come home from work and I would desperately tell him I needed him to take Milo from me. I’d go in the bedroom and sob. It was all so hard. And it’s hard to think back on it and not feel guilt and shame. It wasn’t until this week that I realized the fog has finally lifted. I’m no longer treading just trying to keep my head above water. I’m actually thriving! 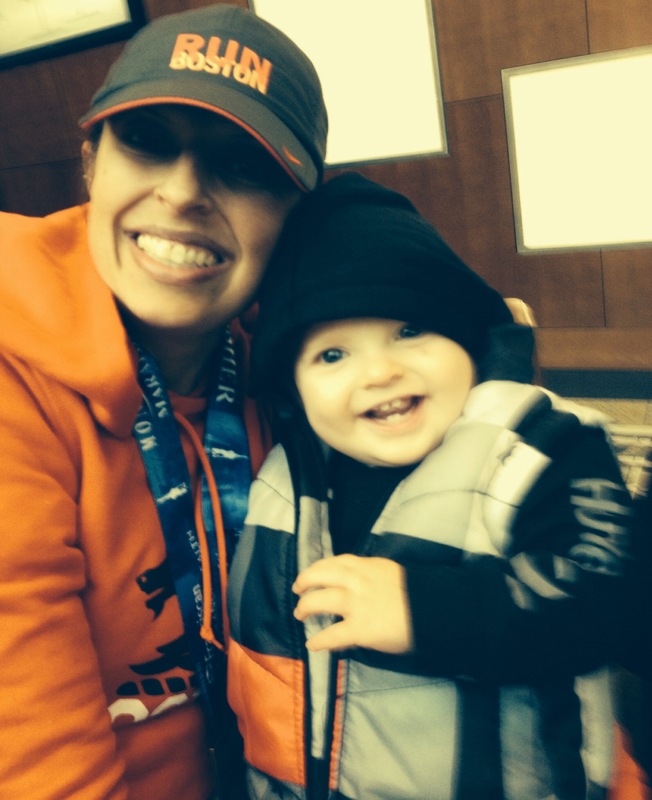 Sure, I’ve run 2 marathons which could be a measure of my postpartum success. I’m managing my household; making dinner every night, baking bread, cleaning the bathroom, etc. They’re all wonderful accomplishments. Nick had a Church Council on Monday, when he came home he told me that more people were talking about my parenting skills. They were impressed with how well I kept my cool on Sunday mornings. I do my fair share of complaining about the situation; I sometimes feel cheated that God would call us to a place that offers me no support as a mom. But as I thought about it this week, I realized that I get frustrated with the circumstances, not with Milo. And more importantly, I don’t take Milo’s mischief and wandering personally. The fact that he likes to explore does not make me feel like I have no control over my child. A year ago, this wouldn’t be true. A year ago, I would have been frantic. A year ago, I would have been visibly distraught. A year ago, I would not be able to emotionally handle this situation. Thank God that time and the fog have passed! My personal training certificate is through the NSCA, the National Strength and Conditioning Association. To keep your certification, you have to renew every 3 years by completing 6 CEUs. It doesn’t sound that hard, except .1 CEU=1 hr. Ok, so every 3 years I have to spend 60 hrs on continuing education. No big deal. Except the NSCA puts a cap on how many CEUs you can receive for one activity. And there are categories (workshops, at home studies, other certifications) with their own limits of how much you can do. In other words, I have to spend a lot of time in conferences, reading books, and taking tests in order to maintain my status as an NSCA-CPT. This year is a certification year, so I’m scrambling to complete my CEUs. On Saturday, I attended the Illinois State Clinic. It was a day of lectures from various professionals in the field. I love these types of conferences. There’s something about being surrounded by like-minded people and getting inspired by what they’re doing. But I was filled with anxiety as I drove up to Chicago for the day. What if someone asked me where I work? It’s a question you would expect someone to ask, especially at an event like this. Well, I’m a stay-at-home-mom. So what are you doing here? I had my obvious reasons. We all were attending because we needed the CEUs. That was a sufficient excuse to be at this conference. But for me, that implied another question: why do you need to remain certified? Sure, my son is an infant and someday he’ll go to school and maybe then I’ll enter back into the work force. Or we’ll have more kids and need the additional income. Or someday I might go crazy at home and we decide that the best thing for the family is for me to get a job. All reasonable arguments for me to keep certified. Except I renewed my certification 3 years ago like I was supposed to, but I had just quit my job as a trainer. In the last 3 years, I have had a lot of jobs but none of them were training or even in a related field. There are a lot of things keeping me from pursuing a job as a personal trainer, even at a part time level. The hours are awful; I mean really horrible. Most people want to train first thing in the morning before they go to work, or in the evening after work. In other words, the time my family has together would become prime working hours for me. But also, it’s really frustrating. People hire personal trainers expecting to get results just because they showed up to their session. I can work a person to the bone but if they go home and binge on the crap food they keep tucked away, they just aren’t going to get the results they want. And they always blame the trainer. In some ways my experience as a trainer brought me back down from my ideal world into reality: it’s hard work and sometimes people fail no matter what you do. So why to I keep spending the time and money for a certificate that has little value for me? I don’t know. Honestly, I have no idea. Right now I’m just holding onto faith. Faith that it will become meaningful to me again. Faith that my failures as a trainer will someday be redeemed. Faith that I will understand how to better motivate my clients to be compliant. And faith that I will find my niche as a trainer. But none of that will happen if I throw it all in the trash today. So I’m doing the work to keep my certification. I’m going through the motions and trying not to worry about the future. But that’s always been my biggest struggle: taking things one step at a time. I failed. My goal was to run a 3:30 marathon in Indy, but I finished in 3:42. I didn’t reach my goal. I failed. I can make excuses. The weather was pretty terrible; 18 mph winds are not ideal for racing a marathon. When it feels like 30 degrees and your fingers are frozen, it’s difficult to open your GU. Milo had gotten a cold the week prior to the marathon and graciously shared it with me. What if things had been different? What if it wasn’t so windy? What if I hadn’t spent my taper fighting illness? What if it’s not my fault I ran a 3:42? Who cares? I can imagine a million different scenarios in which maybe I could have gotten the 3:30, but in the end it really doesn’t matter. Sure, I’m disappointed. I was 7 minutes away from qualifying for Boston. That’s frustrating! But that’s life. When I was studying to be a personal trainer, we learned how to help our clients set goals. One important factor that is often overlooked is that goals should have a 50-50 chance of being reached. You might get it, you might not. This time I did not. Call me crazy, but I think it’s good for a person to fail every once in a while. If you are always hitting your goals, I think you’re not setting good ones. You’re playing it safe, afraid to fail. Well I failed and I failed big. But you know what? That was one of my best races in years. I shaved 45 minutes off my time from May. That’s impressive in it’s own right. My attitude was also completely different. There wasn’t a moment during the 26.2 miles in which I doubted my ability to finish or quit having fun. I enjoyed the run, which is a lot more than I can say about the last couple marathons I completed. And then there’s the fact that I’ve finished 2 marathons since having Milo, and he’s not even 1 yet. I’m proud of that accomplishment regardless of the times. I’m okay with my failure because it doesn’t make me a failure. It was one race; there will be others. If I let one time define me and my ability to run, I would have no reason to keep lacing up my shoes and hitting the road. I believe I am only limited by my own persistence and discipline. I may not be the runner I want to be, but I’ll never get there if I don’t keep at it. Sure, there will be more obstacles. But if there is one thing I’ve learned over the last year, it’s that I have the ability to come back from anything. If I put in the work and be patient. So what’s next for me in terms of racing? I don’t know. That’s a conversation I need to have with my coach. But today I’m supposed to go for a brisk walk and, while it doesn’t seem like much, I’m going to do it. Because each step counts. Because even a brisk walk can make me stronger. Because my failed attempt has not defeated me. And the best is yet to come.